Vanda Anastácio, a professor of Portuguese literature and culture at the University of Lisbon, discussed her research at the Fronteira Palace library in Portugal and how her findings helped her rethink the way women read during Europe’s Early Modern period. PROVO, Utah (Feb. 12, 2016)—What is the price tag of a library? According to Portuguese literature professor Vanda Anastácio, a library’s worth should be measured beyond the commercial value of rare books. Anastácio, a professor at the University of Lisbon, Portugal, was recently involved in a project to catalogue the library of the Fronteira Palace in Lisbon, Portugal. The property still belongs to the descendants of the Marquise de Alorna, a noblewoman and poet from the 18th century. The opportunity to catalogue the library of the Fronteira Palace was a rare experience, as Anastácio said that someone had convinced the current marquis (though Portugal is now a republic, many descendants of nobility still like to use their titles) that the library had no value because there were no rare books contained on the shelves. This led Anastácio and her colleagues on the project to question whether or not the commercial value of a library really is the only indicator of its worth. Anastácio explained that in the case of the Fronteira Palace’s collection, there was much to be learned about the female readership of Europe’s Early Modern period, which opened her to questions regarding women’s interests, women’s roles and women’s impact in European society during the 18th century. From 1539 until 1768, Anastácio said that the Inquisition was in control of the circulation and censorship of books. Then, in 1769, a new law was created that decreed that all private book owners had to send an inventory of their collections to the Royal Censorship in order to determine whether or not they were suitable to be kept in their private possession. In the case of Anastácio’s findings at the library of Fronteira Palace, this was certainly not the case. Anastácio explained that most of the men did not sign their names in the books but rather pasted in a paper saying that the book belonged to the library. Yet in contrast, the women felt the need to write their names in the books to identify them as their own. Analyzing the difference between the ownership marks of the women in the Fronteira household versus the men’s ownership marks, Anastácio and her colleagues were able to determine what the Marquise de Alorna, her mother and her granddaughter were interested in at the time. Looking through which books contained markings from the female readers at the Fronteira Palace, Anastácio said there were some surprises especially when they compare what they found in the inventory sent to the Royal Censorship with the books the family actually owned. For example, though Voltaire was a writer that had been forbidden several times during the 18th century, the marks suggest that the Marquise de Alorna and her mother were reading his plays and other works. Anastácio said that findings from the Fronteira Palace’s library should help us rethink the relationship between women and reading culture in Europe’s Early Modern period. Sylvia covers the Women’s Studies Program for the College of Humanities. She is a junior pursuing a double major in English and French with a minor in women’s studies. 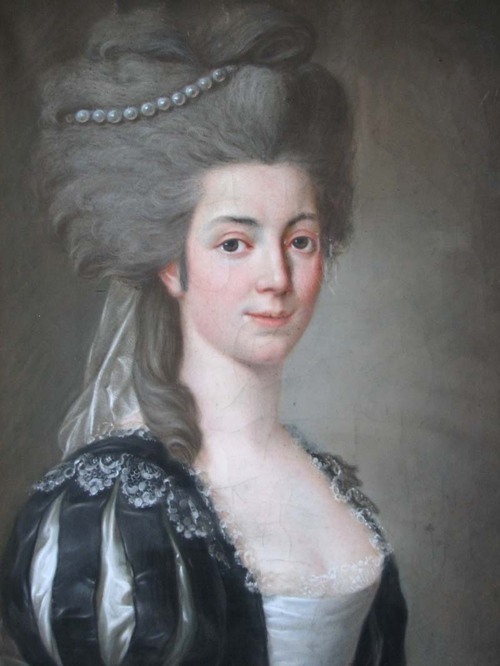 Portrait of the Marquise de Alorna by Józef Pitschmann (1780), courtesy of Wikimedia Commons.